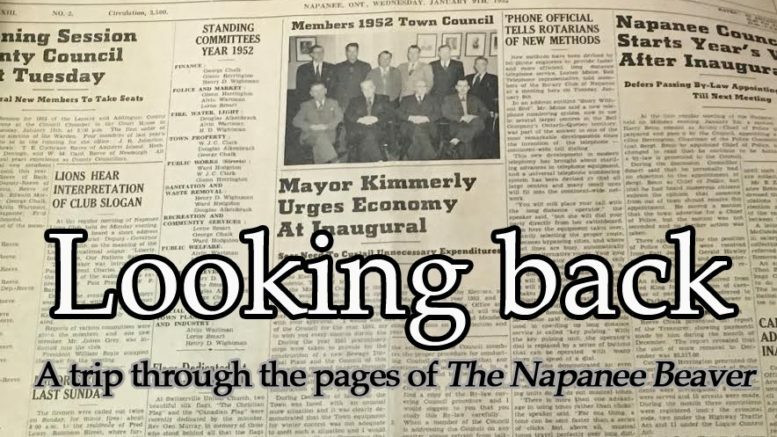 – The Napanee Lions Club was expected to announce a fundraising drive to pay for permanent lights at the Gibbard Memorial Baseball Park at a night game between the Napanee Athletics and the House of David touring team. With greater interest in baseball and a large number of teams playing, utilizing diamonds at night had become a necessity. It was also argued the lights would allow rural fans an opportunity to see games they wouldn’t have been able to see during daylight working hours on their farms. The trend had already moved through Major League Baseball with the Chicago Cubs being the only team in 1948 that did not host night games. – The Ontario Hydro Commission banned lighting for outdoor electrical signage and Christmas trees, electric space heaters, and electricity usage for uninsulated water heaters. It limited lighting in retail establishments after working hours to two watts per square foot of floor area. The moves would take effect in October as a means of reducing power usage and cost in the province. – Eight members of the Rotary Club of Napanee travelled to Rideau Lake, near Perth, for the opening of Camp Merrywood, a new camping facility for crippled children in eastern Ontario. Premier George Drew officiated the opening ceremony. – The Town of Napanee was installing a 24-inch pipe at the bottom of a canal running from Springside Park to the town’s water treatment plant to improve water quality and avoid leakage and repairs. The cost for the project was $68,354. Upon the completion of the pipe, the canal — built around 1840 — was to be filled up. Some councillors questioned whether the pipe was large enough to serve the town’s needs over the long term, but its engineers believed it was. – The Napanee Region Conservation Authority applied for two Canada Works grants totalling $106,000. A $61,000 grant would hire seven workers to build workshops and shelters at all conservation areas, while another $45,000 would hire five additional staff members for conservation and watershed technical planning. – Cafeterias in the county’s high schools did better in the first half of 1978, but still appeared to be a losing venture for the Lennox and Addington Board of Education. Over six months, they turned a $175 profit after posting a $9,676 loss over the same period in 1977. The improvement appeared to be at NDSS. Its cafeteria made $4,712, offsetting deficits of $1,310 at Ernestown and $3,227 at North Addington.